Wednesday, August 19th, 2009 at 2:30pm. Searching the Sarasota MLS for homes and condos? Our sophisticated Sarasota real estate search system provides you the opportunity to search by Sarasota neighborhoods, condominiums or you can search the area with our Map Search or MLS number. We try to make searching for the Sarasota MLS easy, and our high powered real estate search engine leads you right to listing details, photos and virtual tour of homes and condos in Sarasota that meet your criteria. We also cover Longboat Key, Siesta Key, Lido Key and Casey Key. Monday, July 20th, 2009 at 7:34am. As the Sarasota real estate market continues to show improvement, homes for sale on Longboat Key continue to draw an interest from buyers of luxury real estate. Longboat Key, the narrow strip of land between the waters of the Gulf of Mexico and Sarasota Bay, has been a “hot” destination island in Florida for some time. Since Dr. Beach touted Siesta Key on its America’s Best Beaches 2009 list in May, Sarasota beaches have seen even more interest. Our phones are ringing and email property information requests are strong too. Longboat Key offers its visitors and residents fabulous outdoor activities: beachcombing, golf, fishing, sailing, boating, walking, rollerblading, tennis and golf on this 12 mile island. Thursday, July 2nd, 2009 at 7:50am. The selection of Casey Key real estate is currently excellent. Buyers can choose from small beach cottages which need a redo, larger ranch style houses that can be updated or torn down and replaced as well as magnificent waterfront mansions behind bougainvillea draped gates. Tropical Casey Key is the destination of the affluent, entertainers, movie stars and authors. These celebrities love the privacy and allure of this special place. Casey Key is an adventurer’s dream island. Explore the beaches, the jetties, the waters of the Gulf of Mexico. Camera buffs also love the natural beauty of this tropical island with its lush foliage, wildlife and array of architectural styles. Tuesday, June 2nd, 2009 at 8:55am. Searching for a home near Lido Key Beach? Popular streets with homes for sale on Lido Key are Harrison, Garfield, McKinley – all names of United States Presidents. Boulevard of the Presidents is a prestigious address too with homes ranging from $2,300,000 to $3,845,000. In the prestigious Lido Shores area are only 17 homes listed in the Sarasota MLS for sale. These Lido Key homes range from $575,000 to $9 Million. Lido Key homes are located near Lido Beach, parks and famous St. Armands Circle. Lido Key is a great walking neighborhood with restaurants, shops and spas all close to home. Thursday, May 28th, 2009 at 8:44am. Orchid Beach Club continues to be a condominium complex we show often on Lido Key. The two beautifully designed Carribean inspired buildings were built in 2005. Amenities are the big draw at Orchid Beach Club as buyers are particularly interested in top of the line extras when they purchase a luxury property. Located on the south end of Lido Key past the Ritz Carlton Beach Residences, Orchid Beach Club’s beachfront units have wide-open views of the Gulf of Mexico. 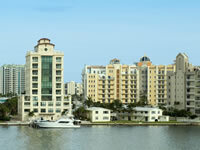 A second building positioned just behind the Gulf-front building offers wonderful city and bay views. You can search the Sarasota MLS and preview the 11 condos for sale at Orchid Beach Club on our websites. Our January 2009 Orchid Beach Club report is available also. Monday, May 11th, 2009 at 10:58am. In 1917, John and Mable Ringling had a vision of making St. Armands real estate and the Circle a shopping and residential mecca when they purchased this mangrove key. Ringling constructed circular streets, a wooden bridge from the Sarasota mainland across Sarasota Bay from the land. Circus elephants were used to help in the construction of the streets and the bridge. The depression hit, and Ringling gifted the land to the City of Sarasota. The dream died for the Ringlings, but decades later, St. Armands got a second look from developers and present-day St. Armands was reborn. Tuesday, April 28th, 2009 at 2:20pm. Bird Key is an exclusive island neighborhood located between St. Armands Key and downtown Sarasota. A tropical gated community where boaters take advantage of the deep water canals and open Sarasota Bay. Many homes in Bird Key were built in the 1950s when Arvida developed the neighborhood. Many of the original Bird Keys homes have been replaced with luxury mansions and others updated to standards of luxury homes buyers in today’s market. Residents of Bird Key can also take advantage of the on private yacht club. The Bird Key Yacht Club is a member of the Florida Council of Yacht Club’s and is a great place for residents to socialize. Sunday, April 5th, 2009 at 9:51am. If you’re looking for a downtown Sarasota Florida condo with waterfront view, sweeping Gulf and Bay views are common at Golden Gate Point. Golden Gate Point’s condominiums offer buyers affordable condos as well as multi-million dollar properties for the most discriminating buyers. Residents on Golden Gate Point can walk to downtown, the Ritz Carlton and Marina Jack’s. Shopping, restaurants, cultural venues, such as the opera, ballet and theater, are a short drive. St. Armands Circle and Lido Beach are approximately two miles from this central location. Sunday, March 22nd, 2009 at 1:42pm. Highlighting an action packed weekend in downtown Sarasota Florida was the 2nd Annual Chilllounge Night. Residents and visitors of Sarasota filled Palm Avenue for the event. The street was turned in to a huge South Beach Style outdoor lounge. Palm Ave was lined with stylish daybeds and outdoor furniture. Saturday, March 7th, 2009 at 6:54am. Bruce Garlitz stopped by our office this week with some excellent information about financing your Sarasota real estate purchase. Bruce is a home loan consultant with Countrywide Home Loans and is a top producing mortgage professional. Buying a home can seem overwhelming to buyers so financing a Sarasota homes can be even more overwhelming. Lending guidelines have changed considerably in 2009 so Bruce steps in to keep our customers informed. Countrywide offers a variety of products and services that may be able to make your home buying process a reality.